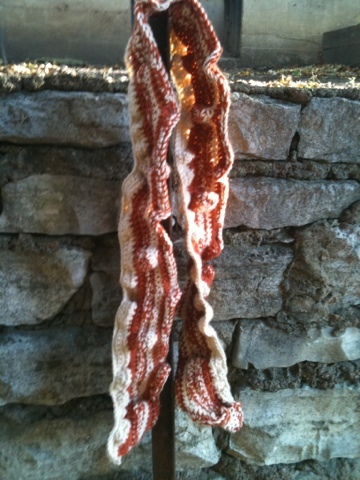 So a friend of mine wanted me to make him a bacon scarf. This is the end result after multiple tries. I wanted it to look crackly and bubbly like cooked bacon. I’m not super happy with the color choices I used, but I didn’t want it to skew too red. I used I love this yarn in burnt pumpkin and Vanna’s choice yarn in beige to get the coloring. He wore to the wineries last weekend and it was a big hit. We named it Kevin the bacon scarf. I hope to have the pattern up on my at my etsy shop soon. Update: I made this scarf available for free. Kevin the Bacon Scarf. Im a vegatarian and I think that is awesome! We’ll can call it the Veggie Bacon scarf. My son is a huge bacon fan. I have to limit the amount Of “I Love Bacon” shirts he buys at ten years old. So this is the ultimate scarf for him. What hook do you begin the project with. I see towards the end where you switch hooks, but not sure which to begin with. I am assuming H?